A balcony was formed by a cantilevering concrete slab. Since there is no thermal separation this poses a significant thermal bridging issue. Apart from the high energy consumption this can also cause condensation and eventually mold formation due to the low surface temperature on the inside. The following article refers to a specific case of balcony renovation. If you have a more general interest in this topic please read our article →Balcony and cantilever floor insulation – a comparative study regarding thermal and energetic aspects. In this case the renovation consisted of applying exterior insulation to the balcony as well as to the window frames. Using HTflux it is easy to evaluate the thermal as well as the hygrothermal impact of the thermal bridge – before and after its renovation. To do this, a section of the balcony is simulated. The section has been located at the position of the balcony doors, as this is the most critical spot. 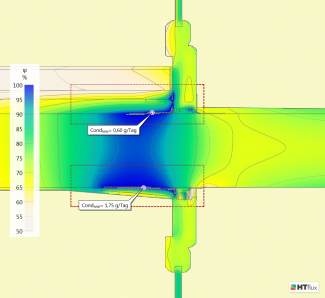 The simulation also contains the precise floor construction as well as an insulation wedge already mounted to the ceiling to prevent condensation. Climate conditions have been chosen to match the German Standard DIN4108-3 (exterior: -10°C/80% RH – interior: +20°C/50% RH). Of course, the simulation can be repeated using any other temperatures, such as local climate averages. 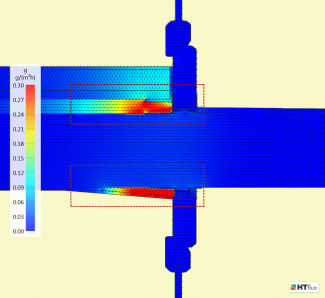 The thermal bridging effect is quite significant. 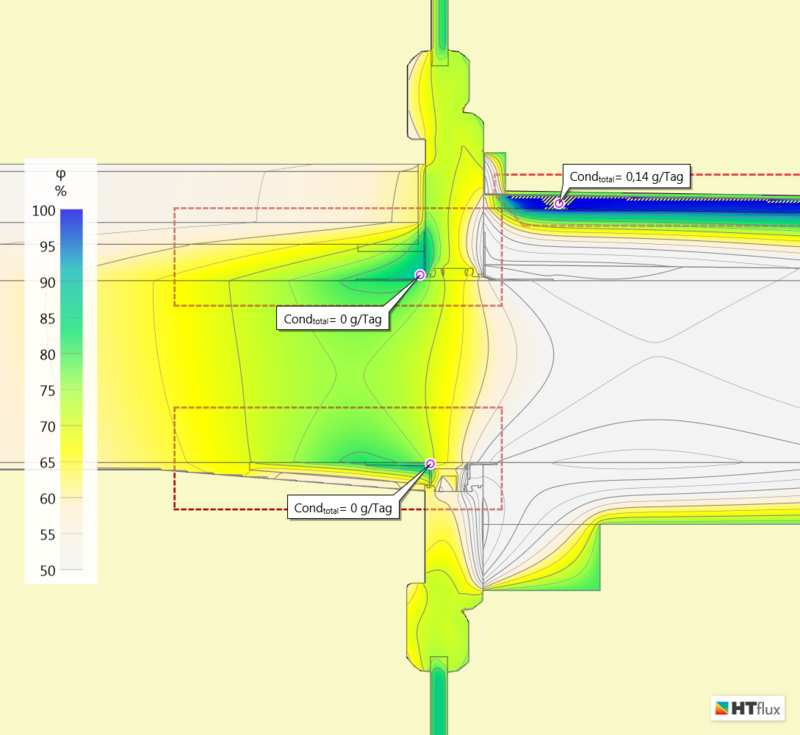 HTflux measures 23.7 Watts exiting from the balcony slab. (In this case the ‘heat flux measurement tool’ has been used, as the ‘PSI tool’ would also measure the energy loss through the window frames). To illustrate this amount of energy you could imagine replacing the 25cm high segment of the balcony with a 4m high wall having a U-Value of 0.2 W/m²K. Further, the thermal bridge results in very low temperatures inside the concrete leading to condensation. 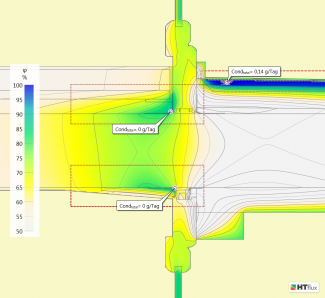 Only by the application of the insulation wedge condensation on the ceiling could be prevented. The level of condensation is considerably higher on the ceiling side as the floor construction reduces the amount of water vapor that can penetrate into the concrete. The amount of condensation would still be acceptable as this could still be absorbed by the concrete. However any cracks or joints in this area would significantly increase the amount of condensation. The renovation of the balcony consisted of applying exterior insulation to the top and bottom side of the balcony as well as to the window frame. On the top side of the balcony OSB panels form the new floor. Finally the balcony was covered with a synthetic roofing membrane. With the application of the thermal insulation the energy loss of the balcony could be cut by half. This represents a significant improvement, however heat loss is still elevated compared to situation of an optimally thermally separated balcony (e.g. by using insulation baskets such as ‘Isokorb’). Minimum temperatures could be increased by 1.5°C on the floor side, and 4.5°C on the ceiling side. This represents a significant improvement as temperatures now range above the dew point temperature throughout the entire balcony. The vapor proof sealing of the balcony now causes condensation on the external side of the balcony. The amount of vapor penetrating from the inside is very small though. However the construction is still unfavorable as moisture in the balcony (e.g. being caused by structural damage) is hindered from leaving the construction. 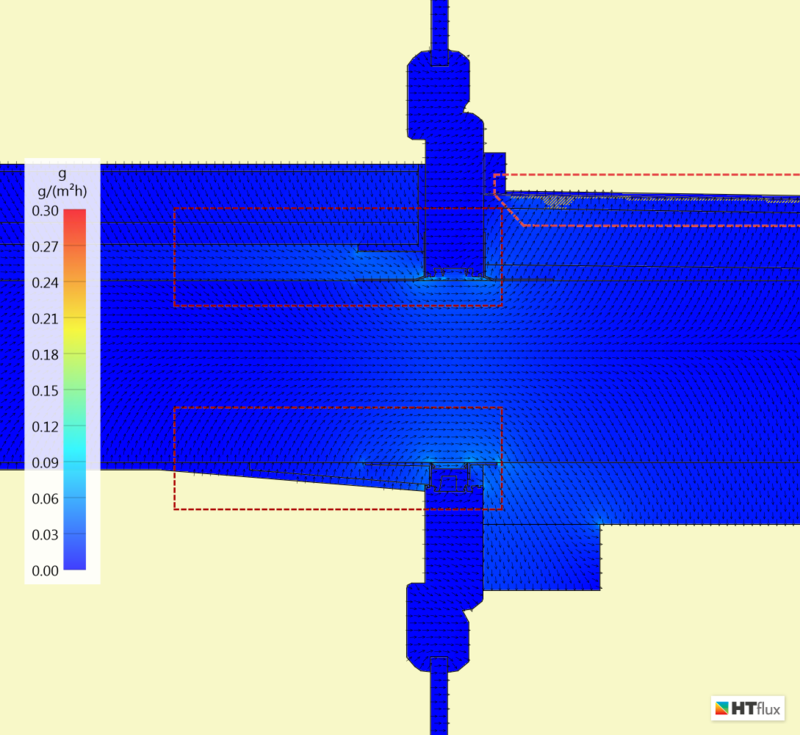 A video of the temperatures and heat flux of a thermally not separated balcony is shown on our YouTube-channel. The videos are also available with high resolution.